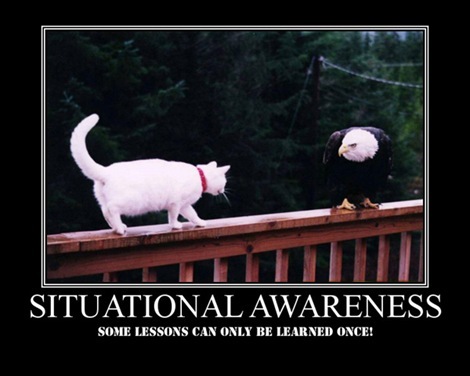 Long Term Situational Awareness Can Give You The Edge, by Todd S.
I’ve been fortunate to live in the same general area for my entire adult life, the Rocky Mountains of Utah. I am very familiar with the area made more so by various employments, a variety of interests all centered around the outdoors and twenty years of being a Scout Master. Being familiar with my surroundings for a long period of time increases my knowledge base of useful things to know, information unique to my immediate surroundings. I have always been curious and a great observer, of both people and things. Some years ago my brother mentioned something to me when we were talking about being prepared if anything big should happen. At the time he worked for a national car wash company, traveling around the region inspecting various car washes. He said he didn’t need to store a fresh water supply because all of the car washes have enormous tanks of fresh water underground; most have more than 2,000 gallons. People didn’t know this so he figured he could use these as a source for fresh water. A light bulb went off in my head. This conversation was the start of what I call my Long Term Situational Awareness. I am always on the look out for information that could help me if I have to G.O.O.D. or heaven forbid if TEOTWAWKI happens; information, places and people that I store away in my data banks so I don’t have to figure it out on the run. For example the water tanks underneath car washes, I might have figured that out eventually, but now I know right where to head. Here are some of the things I have made mental notes about that I think will give me an edge. Maybe you can keep an eye out for this stuff in your immediate vicinity. The longer you are in the same area, the more information you can collect. The more stuff you know, the better your odds are of getting out and surviving. ESCAPE ROUTES: Where I live we our bound on the West by a harsh desert environment, not a good escape route. To the East are mountains, which I know intimately from hunting and camping, especially every paved and dirt road in an out of them for fifty miles. It would take several road blocks to prevent me from getting where I wanted to go if I choose to go that direction. This direction is my choice if evasion or defense is the highest priority. There is only one North South freeway, which of course would prove completely useless. A bottle neck of both surface streets and alternate routes to the South make this direction a bad choice. To the North, a bottle neck of alternate routes is still passable but not ideal. A little known closed rail road line, (Google Earth is a great source to start looking for these kinds of routes.) is only blocked by a flimsy gate. It bypasses the bottleneck by twenty miles. A friend showed me this years ago as an access to some hunting ground. I realized its other potential as an escape route and have never forgotten it. If I have to bug out, I’m going north. FOOD: We all know the grocery stores, convenience stores and restaurants will be looted first. I’ve noted several places that might be over looked at least during the first few days. I keyed in an idea several years ago that anyplace that serves meals to large groups of people will have stores of food. There are two small convention centers within five miles of my house. They are not in a retail, shopping or restaurant area, they are in the office and business districts. I go to both several times a year. Every night of the week they cook and serve dinner for several hundred people. The convention centers have storage rooms and commercial kitchens that will probably be overlooked in the first few days [of a societal collapse]. Any place with a snack bar, especially in an overlooked area, is a great source for food supplies. I know of three indoor soccer arenas with snack bars. All are in warehouse and industrial areas. All of them have snack bars and I’ve noted where the storage rooms are for the snack bars. Two of the soccer arenas are on my bug out route. The last several years I have seen an explosion of small gyms, many in strip malls and professional office districts. Nearly all of these small gyms have supplies of nutrition and protein bars, bottled water and re-hydration drinks. Most will be overlooked the first few days. Most Boy Scout camps store and cook food for hundreds of people everyday. I know of at least a dozen scout camps along different travel routes. We have three, regional food distribution centers. These will be hit hard, but I know where they are and won’t have to look for them in the telephone book. What might be overlooked are the restaurant food supply companies. Not only might their warehouses be missed at first, some people might walk right pass a SYSCO semi truck and not realize it is filled with food. One semi truck from a restaurant supplier and I’m set. I know the names of all the suppliers and their logos. Fuel: Two miles from my home is a warehouse complex with over two hundred companies and a thousand semi-trucks, all with big fuel tanks, going in and out every day. It will obviously be looted, but it is so large the out lying trucks and smaller ware houses will go unnoticed at first. Excavator companies and large construction companies often store their own fuel. I’ve hired several of these companies and have identified three that are located in areas that may be easily overlooked. There is farmland all around me. Many farmers store fuel. This would be a last resort for me because they also have guns, know how to shoot, are willing to shoot and if any group will survive WTSHTF it will be farmers. A few random notes I’ve taken over the years in case I find myself in TEOTWAWKI situation. I know where three large sheep herds and two large herds of cattle graze in the summer. I know where a high-fence elk hunting outfit is located with 300 head of elk. I know of three small residential subdivisions in the mountains that are self sustaining, on there own wells and solar powered. I know of three large snowmobiling lodges in the mountains that are self sustaining. They are virtually abandoned six months out of the year. I know where a small, private fish farm, surrounded by a hundred fruit trees can be found two miles past a locked gate. I know where all of the wildlife resources fish hatcheries are. I know where a rancher has sixty head of domesticated buffalo penned in a remote mountain valley. All of these observations have taken no extra time and effort, simply the realization that someday I may need to know this stuff and it would be a good idea to remember them. Keep your eyes and ears open, you never know what will pop out at you if you’re looking for it. You never know what piece of information you store in your data banks will give you the critical edge. JWR Adds: Most of the foregoing would only be appropriate in the aftermath of a situation with massive depopulation, such as a pandemic. In anything lesser, appropriating "abandoned" supplies would simply be unconscionable theft, because those supplies would still have rightful owners. There have also been several discussions in SurvivalBlog about the inadvisability of crossing private land that belong to someone else. Even worse is shooting someone's livestock. In essence, that is just a good way to get yourself ventilated, in the event of a societal collapse. I have posted this just to show SurvivalBlog readers one sort of threat that they will face. It is encapsulates the horribly astray and ill-advised "justified looting" mentality. Keep plenty of .308 ammo on hand. You may need it.